FoundersCard offers industry discounts & benefits for entrepreneurs. Instant access to a multitude of discounts and benefits along with member-only networking events. Thousands of high-quality tracks that can be filtered to achieve the optimal tone or mood. An annual fee of $595 per year (plus $95 initiation fee) or discounted $495 membership via a member referral. Entrepreneurs, startups, founders and high-level executives who are looking to save on business-related expenses and travel. From my experience documented throughout this review, FoundersCard has be proven to be a worthwhile purchase for me as I easily made my money back on the annual fee. However, the assortment of associated perks might not cater to your needs (apply here to see them before signing up) especially if you don't already spend a great deal of money on business or travel related expenses each year. As an entrepreneur, I'm always looking for ways to save money on business expenses as well as network with other like-minded individuals to help grow my company. I am also a frequent user of credit card perks and rewards, so I have been following many of the blogs and communities surrounding this industry such as The Points Guy. In the past, I have seen a unique service mentioned called the FoundersCard and decided to find out more for myself. Shortly after discovering the loyalty program geared for entrepreneurs, I applied to this invite-only membership and got to experience its perks for myself over the last ten months. 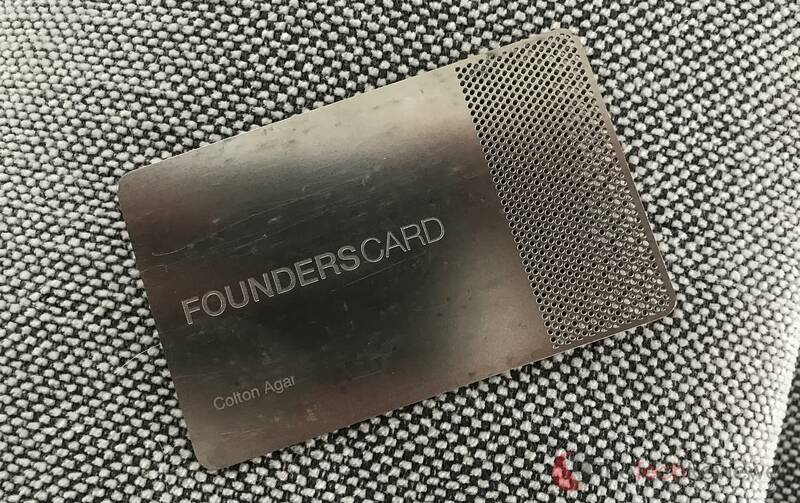 How Much Does The FoundersCard Cost? What Are The FoundersCard Benefits? How Much Value Have I Received From My Membership? 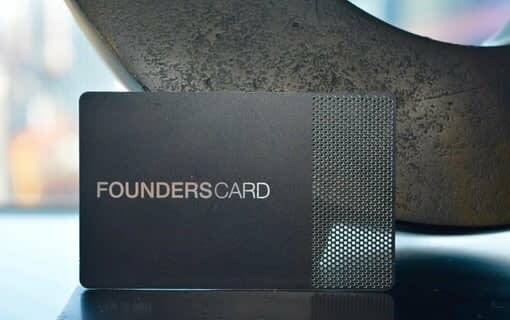 Is The FoundersCard Right For Everyone? In the following review, I will touch on many of the questions surrounding the FoundersCard and describe both the pros and cons of my experience within the platform. While I will not be able to touch on all of the perks, I will do my best to cover enough information to help aid any potential new members. Keep in mind, despite being a FoundersCard member, I was NOT paid or endorsed by FoundersCard to write up this review or share my experience (full disclosure, if you decide to sign up with my referral code it will save you and me money on our memberships). All of the thoughts and opinions stated in the remainder of this article are based on my own. As you read along, you'll see I also cover the negatives to the membership and how I think it is the not the right investment for everyone. I am going to get straight to the point as many people have misconceptions as to what the card is and isn't. First off, it is NOT a credit card with no way to put charges on it nor does it serve as an alternative to cash or credit.Instead, it is more like a traditional AAA membership where it grants the cardholder perks in the form of discounts and networking access for a flat rate per year. 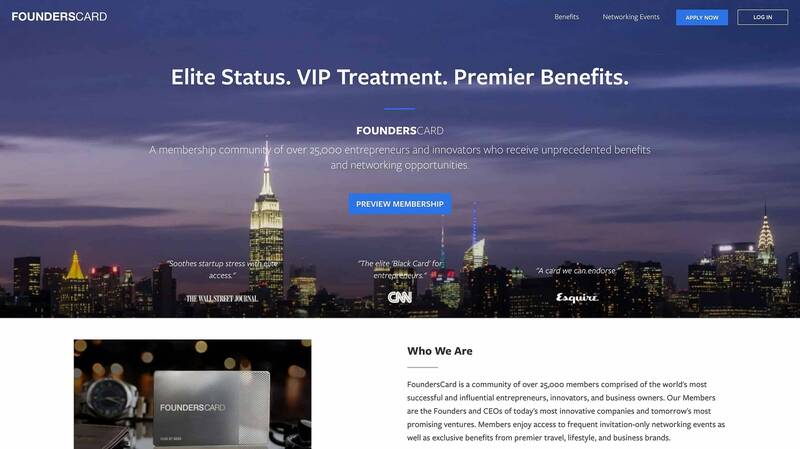 Most of the value gained from FoundersCard comes from the wide array of discounts and perks offered to entrepreneurs to earn savings on travel, business, and lifestyle expenses. If you live in or close to a major city, FoundersCard does host numerous networking events throughout the year, so there is a good chance they host one in your area at some point in the future. My physical FoundersCard (cool although unnecessary for nearly every redemption). These are the two primary ways to benefit from the FoundersCard in exchange for the yearly fee. Depending on your business needs, it can easily justify the membership cost and save you hundreds or even thousands of dollars annually. Each membership includes a physical version of your FoundersCard used for gaining access to the networking events and is sometimes required for in-person redemptions (such as hotel stays). For browsing and redeeming online discounts and access, you will be granted access to their member-only web portal along with their mobile app and chrome extension (notifies you when you access a retailers website that offers a FoundersCard benefit). Becoming a FoundersCard member is not an overly complicated process, but it does require filling out an application which then has to be approved by their team. The application requires providing basic information about yourself like your name, business name, role at the company, email and referral code. There is no financial or sensitive information requested as again, the FoundersCard is NOT a form of credit. Now for someone applying without a referral code, the current annual rate is $595 a year in addition to a one-time initiation fee of $95, and this pricing could increase in the coming years. If you use a referral code form an existing member such as myself (our referral code is THETECHREVIEWER), then this rate is dropped to $495 a year with a waived initiation fee. Whatever price you pay with the referral code is locked in for renewal fees for the life of your account, so there is a significant benefit to using a referral code if you want to save money on the membership. FoundersCard concierge who can help assist with travel booking and recommendations on restaurants, airlines, hotels, etc. As a standard member, I don't see any reason I'd upgrade unless I plan to purchase another membership for a colleague or family member in the future. The perks are a bit too vague for my liking, and I'm not sure there is a clear enough explanation of the increased value in return for the higher annual fee except when needing to add a spouse or team membership. The name ‘FoundersCard' implies that it is only available to a company's founder, but the criteria for approval is wider than that, and it can be applied to anyone with a primary role in a business or entrepreneurs of all types. Between all of the different categories and subsections within them, there are far too many benefits available to name one by one, so I'll be covering the most notable below. Those interested in browsing the entire backend of the FoundersCard benefits, you can do so after applying via this link. Since many members are frequently traveling for business purposes, the FoundersCard provides a hotel & resorts program that offers a discounted rate, flexible cancellation privileges and even complimentary upgrades and amenities. Both domestic and international locations are available spanning nearly all the major cities you could want (most hotel benefits can be easily applied online using promo codes). Beyond deals with specific hotels, FoundersCard has also negotiated deals with notable chains like the Four Seasons, Starwood, Marriot, SLS Hotel Mandarin Oriental and more.From a business traveler's point of view, I think this is the real gold mine in the FoundersCard investment as you can quickly recoup your $500 in just a single stay (or a few depending on your location). At somewhere like the Park Hyatt New York which typically runs $1,275 for their Park Deluxe Room, but FoundersCard members will only pay $645-795 depending on the booking dates. With Las Vegas being a hotbed for business conventions and industry tradeshows, those frequenting Sin City can benefit greatly from the FoundersCard. Since I travel to the Consumer Electronics Show every year, the Vegas perks were incredibly enticing for me and one of the primary reasons that drove me to sign up for the service. 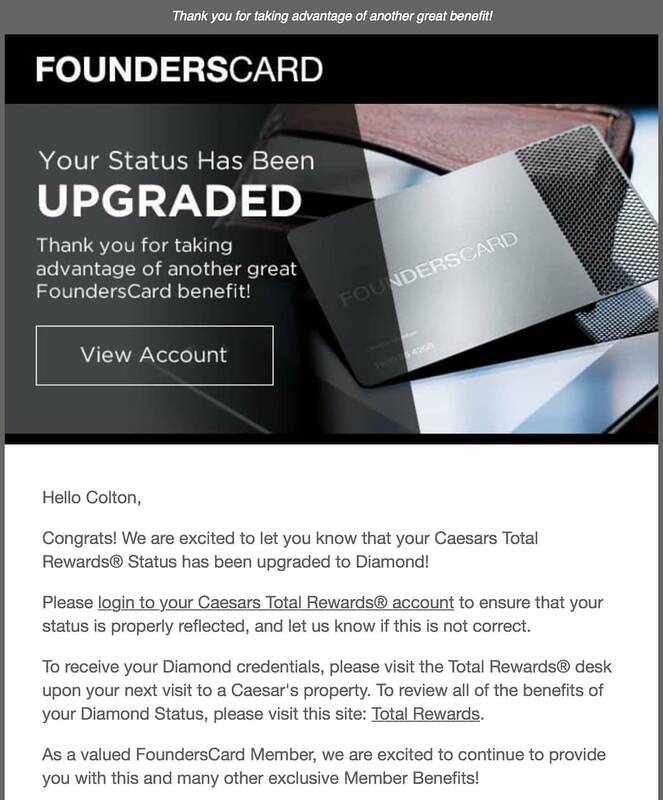 Teaming up with Caesars Entertainment and their Total Rewards Program, FoundersCard members are given a complimentary Diamond status (2nd highest in the tiers). Also, members receive 20% off the best available rate at Caesars Palace and associated properties including the Flamingo, the Cromwell, Nobu Hotel, Rio, Planet Hollywood, Paris and the Linq. Since I'm not a big gambler, my favorite perks are the room discounts, preferred restaurant pricing, Diamond Lounge access (free food and drinks), $100 celebration dinner gift credit, priority check-in, and the removal of resort fees which can save you hundreds per stay. The lifestyle section deals more with day to day luxuries and can be broken down into multiple sections: experience & access, health & fitness, premium retail and iLifestyle. Beyond the hotel discounts, there are other travel-related benefits that FoundersCard members can utilize to save time and money. These include discounts on flights from airlines like Cathay Pacific Airways, Virgin Atlantic, Virgin America, British Airways, Jetblue (they recently ran a status match upgrade to Mosaic and offer bigger discounts on Mint fares), Quantas, Emirates, Singapore Airlines and Alaska Airlines. Besides cheaper flights, the membership also grants ways to obtain faster elite status on American Airlines (Platinum Status challenge), a complimentary Marco Polo Club Silver membership on Cathay Airways and a complimentary Flying Club Silver Elite status after a single flight with Virgin Atlantic. CLEAR is an alternative to TSA Precheck and is expanding rapidly at larger airports. FoundersCard members receive a free 6-month trial of CLEAR along with a discounted fee of $140/year after instead of the standard $179/year rate. High rollers who insist on flying a private jet can even score a free 3-month JetSmarter membership as well a $2,000 in flight credit should you purchase an additional membership during your trial period. Fortunately, the travel perks don't just apply to the air and also are eligible for limo and car rentals. The perks include discounts, and in select cases, a complimentary loyalty status at rental car services including Herts, Avis (receive complimentary Preferred Plus membership), Sixt Rent a Car, Silvercar, Zipcar, Carey, EmpireCLS, Getaround and Groundlink Car Service. With a membership geared towards business owners and professionals, this is another segment of FoundersCard where a lot of potential value can be gained. Most of the perks are great and useful to business owners of all types, but also where you'll see the largest amount of fine print when it comes to redeeming these benefits (I'll get more into this later). The ‘business' section of FoundersCard is broken down into four sections: business essentials, web services, marketing & research and co-working. There is a famous saying “your net worth is determined by your network, ” and this is often shown true in business. Each year FoundersCard holds networking events at popular hotels or resorts in major cities for nearby or visiting members to meet and greet. Since signing up for membership, the closest event to me was in Boston back when I was still living in Massachusetts. Now that I've relocated St. Petersburg, Florida, there is an upcoming event in Miami that I may attend although to date I haven't been able to participate in any of the FC events. However, this year FoundersCard is holding an event in Las Vegas during CES (January 12th, 2018) and I have plans to attend and have already RSVP'd through the member portal. While I haven't had the chance to get an experience of how much value is in the FC events, I do see some potential in the contacts that I could make during this time with the CES event's guest list currently at 98 members and is growing by the day. I stopped by the FoundersCard signature event at CES. The venue was at the Mandarin Oriental which is a gorgeous hotel, but the event was held in a small room in the back of a crowded bar. Due to complications in my schedule, I could only stay for about 30 minutes although I did meet a few other interesting members. There was only one FoundersCard staff in attendance who was working the door (I believe it was the CEO) and a small bar/light appetizers. In terms of networking opportunities, most of the people there were from a very scattered background so I didn't meet any contacts that I thought were overly valuable although it was a decent experience overall. Would I travel a significant distance to attend this type of event in the future based on this experience? Probably not. This is true, but I do think some of the critics over-exaggerate the extent of both of these aspects. While I've experienced both cases, neither have really given me a bad taste in my mouth as I've always been able to redeem as instructed via the fine-print. The fine-print is most relevant for the business perks as things like Apple loyalty pricing and the UPS discount have spending tiers to get the maximum value. This means the more you spend per year with Apple or per month with UPS, reflects the overall discount you are given on their products and services. As for perks disappearing, I originally saw a lot of value in their MailChimp perk which offered a whopping $2,500 in MonkeyRewards (pre-paid credit) for FoundersCard members. I was able to redeem it without a hitch, but the perk and since been removed without warning. I had concerns about my Caesar's Total Rewards Diamond membership which is only good on a yearly basis. The Total Rewards system automatically downgrades its members status every January 1st unless the standard 15,00 Tier Credits are reached. Email notification about my Diamond status upgrade. We have enjoyed the partnership with Total Rewards for a few years now. The contract is up for renewal each year in January, and if it is renewed, they will extend the “valid through” date of your Diamond upgrade through FoundersCard. While we aren't allowed to guarantee this contract will be renewed next year, we don't anticipate any changes to the program. Please let me know if you have any further questions. Have a great day. While I felt a bit uneasy that there was a chance the contract would not be renewed, that wasn't the case so my account was upgraded back to Diamond within days and I was able to redeem the perks at both CES 2017 and CES 2018. In the past, people have complained about the lack of support from FoundersCard staff, but so far my experience has been good overall. I've consulted the customer service on more than one occasion to receive clarification, ask questions or give feedback and always received a polite response back in a timely manner. After signing up, I had several representatives reach out to discuss the membership and be available if I needed any additional information including trying to schedule an introductory conversation via phone (which I declined due to my hectic schedule). I have also ready some unhappy customers who have said FoundersCard rebills them after they have canceled the membership before its renewal. This was clearly a concern of mine in the event that I didn't receive the agreed upon value from my first year of membership and wanted to leave the service. If you want to cancel your membership or not be on auto-renewal you simply have to call or email us your request. Please let me know if you'd like to set up a time to talk! While I have to take her word for it, the customer support does seem solid at this time and I would be very surprised to see them not honor a prior cancellation before a re-bill based on my support experience thus far. A reasonable perspective and one that I can't argue for most people. However, this card isn't created for most and it is geared for business professionals and entrepreneurs who are already spending a considerable amount of money on lifestyle and business expenses or travel costs. Depending on your needs and budget, the FoundersCard's target demographic should be able to make back their initial yearly fee in savings and start banking cash after taking advantage of just 1 or 2 of the long list of perks. If you don't see perks that you'd utilize from the membership preview page (available for viewing after applying here) then I would not recommend signing up. Now that I've run through the potential of the FoundersCard membership and its benefits, I'll talk more about how I have been able to save time and money using it over the past year which happens to be my first year as a cardholder. Keep in mind, everyone's needs are different and the perks that I utilize could be much more valuable to me than they would be to you and vice-versa. Being that I haven't traveled as much as I plan to in the future for tech events and keynotes, the value of my membership likely will rise significantly further in addition to the business savings I'll be able to harness when expanding the company further (think more office furniture, computers, marketing costs). At the time of my sign-up, this was the perk that really convinced me to go through with the membership as it meant an immediate $2,005 worth of value for as I pay MailChimp $75/month for my email marketing subscription. Redemption was easy just requiring me to file a request and I had the ‘MonkeyRewards' credit in my account within 24 hours. Since then, the monthly cost drains from the $2,500 in rewards instead of from my credit card like in the past. In total, I should get about 33 months or just a few months shy of three years of my current Mailchimp costs for the price of a membership. However, like stated in the previous section, perks can disappear overnight and this is a perfect case as it is no longer offered for new or existing members. Needed a reliable e-fax service (see our top picks) for business use and Phone.com allowed for this with a free year of their basic plan. Redemption was simple and it got the job done. All-in-all, I saved $120 from this perk for my first year although I don't plan to renew this service at full price when my free year expires. One of the biggest perks that appealed to me was the complimentary Diamond Total Rewards status at Caesar's properties in Vegas. I created an account and got it upgraded in time for my CES 2017 trip. We stayed at the Linq, a Caesar's property across from the Venetian that is relatively nice with great value on the dollar. My first benefit was being able to skip the long lines of the normal hotel check-in and carry it out from their exclusive Diamond rewards lounge. It featured great decor and helpful staff who gave me the rundown on my Diamond membership as well as offered me a free room change from one area of the hotel to another which offered a better view and less noise from the busy street below, but the room size remained the same. I got my Diamond card printed on the casino floor and was able to get my annual $100 celebration dinner rewards voucher which offers qualifying members $100 off dinner at a Caesar's restaurant once per year. I split the credit with my two colleagues and we decided to redeem it at the world famous Bacchanal Buffet in Caesar's Palace which runs at $59 per person. The food was amazing and besides the $100 credit, we were able to skip the line (the wait was just under 2 hours) and sit at a table reserved for Diamond members. 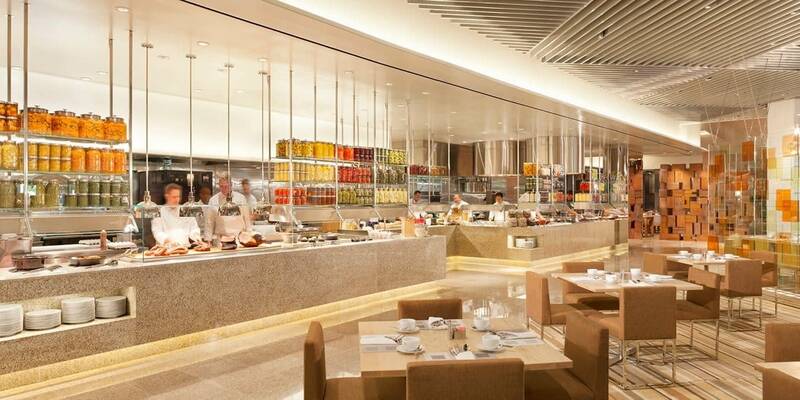 The amazing Bacchanal Buffet at Caesar's Palace. At checkout, I was able to take advantage of the Diamond rewards lounge in the Linq yet again and thanks to the FoundersCard membership, I saved $170.05 on resort fees which are waived for Diamond members. Update (1/22/18): At this year's CES, I didn't stay at a Caesar's property, but I went back for the free $100 anniversary gift card and was able to get and redeem it again with no issues. Once again, I used it at the buffet and this time we were able to skip a line that had an estimated wait of two and a half hours (it was a packed Friday night) with one of the best tables in the entire restaurant! Another perk that interested me greatly prior to sign-up was the AT&T discount. I applied for it shortly after my membership was approved and the savings were immediate on the next bill. Since I have four lines on my family plan, I originally received a bigger discount as my total bill was higher. However, since AT&T has reintroduced their unlimited family plan at a lower rate which brought my total bill down by about $80. Since the AT&T perk only gives 15% every voice and data plan over $30 in value, my monthly discount from FoundersCard is currently at $9 per month. All-in-all, I saved $143.55 from this perk in the past 10 months although the projected savings for next year would be $108 based on my new AT&T plan pricing. While I wouldn't have paid to subscribe to a physical magazine at this point in my life as it is a dying industry, I don't mind free stuff and they make great accents around the office and for bathroom reading. Was able to sign-up for both magazines for free and have them shipped to my home without issue although it did take a month or two before I saw the first issues arrive. 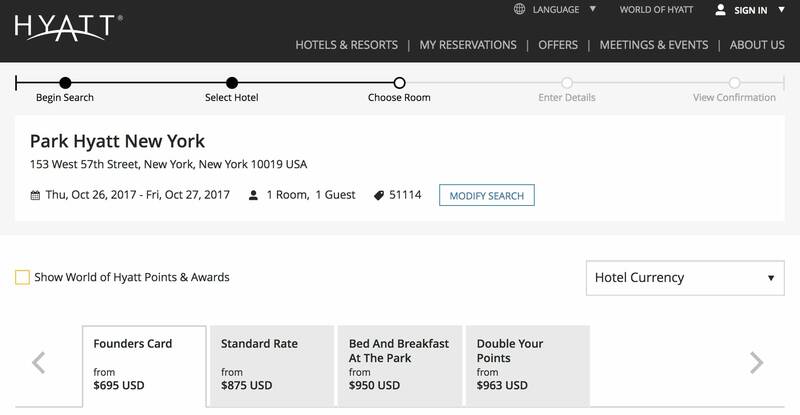 Took a trip to NYC for a photography trade show and was able to score $119.50 in savings when staying at the unique Yotel in NYC. The redemption process was easy, being able to do so through a special web portal link with no hidden surprises or discrepancies. 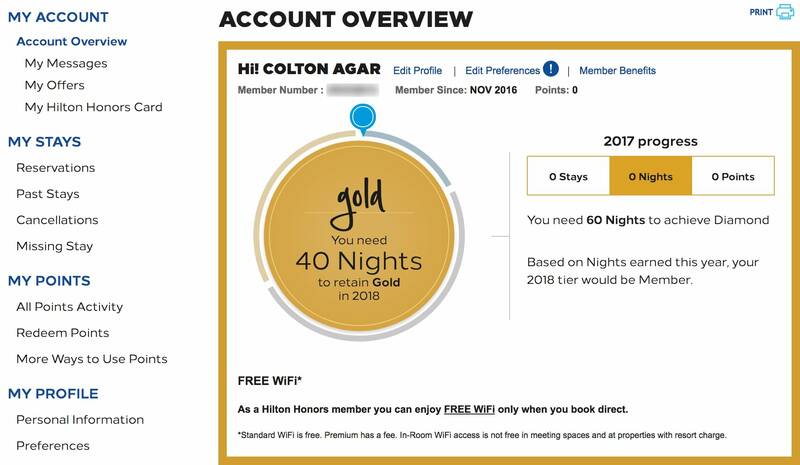 This is the current value of the Hilton HHonors Gold status from the calculations of popular travel blogger, The Points Guy. This status tier within the hotel chain offers bonus points off stays, a free fifth night on bonus stays, two bottles of water per stay, room upgrades, breakfast and your choice of bonus points or a welcome amenity. I was able to redeem this quite easily after signing up for a Hilton HHonors account and giving this information to FoundersCard. Once accepted, I was also able to status match on to Best Western to receive their ‘Diamond' loyalty status as well. I had heard a lot of good things about the Grasshopper phone system and decided to take advantage of the free credit that comes with my FoundersCard membership. The Grasshopper perk details page says you get a complimentary $50 credit when creating a new account and waives the $25 activation fee. After signing up, I was pleased to see that I wasn't charged the $25 activation fee and I also received $75 in credit (not the advertised $50). My first Grasshopper invoice showing the $75 FoundersCard membership credit. Looking back, I have clearly been able to get my money's worth on my FoundersCard membership during the first year. This number looks more significant due to the $2,500 in credit that I received for MailChimp, but new members aren't eligible anymore for this perk so my savings without it would be $1,933.08 which is still very reasonable considering I am not taking advantage of even a tenth of the available perks. While I'd be less likely to have signed up without the MailChimp credit available to me as a potential member, my experience over the last 10 months has been positive overall. I will be renewing my FoundersCard membership another year as I plan to be travel more in the coming months for business and believe I will continue to reap increased savings on airfare and hotels. If you were to ask me whether a FoundersCard membership is right for everyone then the simple answer is no, but their target demographic is NOT everyone. If you are an entrepreneur, business owner or high-level executive then you are the FoundersCard target demographic and thus you'll find the most use out of their benefits. As someone who owns a tech business and travels a small portion of the year, I was able to find more than enough savings to make the yearly annual fee worth my investment and as I continue to travel more as the company grows, I see my yearly return rising. Some of you may be better off just using rewards credit cards such as one from Bank of America, the Chase Sapphire Preferred or American Express Gold Cards). This way you can redeem travel rewards through business purchases which won't be as beneficial in savings for big spenders, but cheaper in yearly membership costs. However, if take a look at the preview membership perks page (available after applying) and don't have any major benefits jump out to you as something you'd take advantage of to save yourself time or money then I don't think you should apply for FoundersCard. We hope you enjoyed our FoundersCard review ! Hey- Great article. 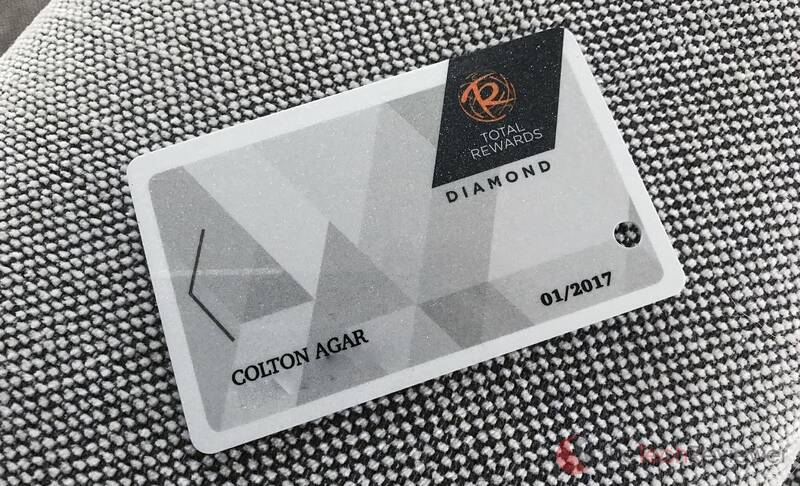 It looks like Total Rewards Diamond Lounge access is going away in 2018 unless you hit certain tier credit levels in the program. “Several months ago, we announced that complimentary Diamond Lounge access in 2018 would be exclusively for members who reached a 2017 or 2018 Tier Score® of 25,000. Great news! We are extending your unlimited complimentary Diamond Lounge access through March 31, 2018. Plus, we want to make it possible for you to continue enjoying the benefit you love throughout the year. Once you surpass each of these targets you will be able to enjoy complimentary access through the end of that access period1. Don’t forget! Daily Tier Credit bonuses can help you reach these targets quicker. You are welcome, Dwayne! I am glad you found it helpful and hope you were able to determine whether or not FoundersCard was a good fit for your situation. I just renewed for my second year and will continue to update this article in the future with any new developments. If you have any further questions/concerns relating to FoundersCard, just ask! Best deals and amazing benefits! Well worth the money! Appreciate you sharing this tip! However, I believe I tried to get the M-Life status match and they were no longer offering it. Couldn’t find any further information online. Did this work for you? Borgata Hotel changed its loyalty programme to M life Rewards last June and has been offering tier matching for CET Diamond holder. So the way of getting M Life Gold is to visit M Life rewards desk at Borgata Hotel in person and present your valid physical card and a piece of photo ID I guess. Awesome, I was unaware of the Borgata’s change. Thanks for sharing this valuable tip! Here get you a good news to your TR Diamond. Hard Rock: Atlantic City is giving away a special offer just for showing them your current player’s club card. For TR Diamond holder, they are offering up to 1 free nights. I think this could help you save one night hotel charge if you would like to go to Borgata for a tier match. Thanks for this insight James, seems like a viable option! FoundersCard is a an auto-renewal scam. They play fast and loose with billing your credit card. If you aren’t paying attention, rest assured, they are. If you cancel auto-renew, they will often reactivate it. 99% of their benefits are worthless. If you cancel your membership, they will bombard you with ‘special’ offers. They will even make veiled threats about taking annual perks you already paid for and redeemed. The only perk they have worth anything is Diamond at CET, but it’s only worth the hassle if you go to Vegas 3 weeks per year AND are a low-roller. Some savings they advertise up to 25x more than they actually are. Don’t give them your money unless you’ve calculated your savings on a benefit ahead of time. It’s not an elite membership to anything, that’s just their sham image. Again, the card is intended for business/startup owners so I don’t anticipate the average person finding a ton of value in it, but for someone with a lot of travel and business expenses at companies with FoundersCard perks then you will see value (I mention several times to check out the membership perks BEFORE signing up). It surely isn’t a scam by any means, but it definitely isn’t a worthwhile investment for everyone. I’ve also spoken to several people who have canceled without issue so while I have heard this complaint before, it seems to be rare. If I were you and I wanted to end it, I would just dispute the charge on your credit card. As long as the card is with a reputable company, you shouldn’t have an issue getting your money back and halting all future charges with the dispute. Thanks for your article. One aspect wasn’t covered though. What if you feel being among their targeted audience, but not based in the US? I feel much of the perks are US centric. Did I miss something? I am based in the United States so I’m not sure how to evaluate the perks internationally. However, I think it will depend on the person and the type of perks that you plan to take advantage of. Do you travel often? If so, the perks of international flights and hotels will likely offset the costs rather quickly. 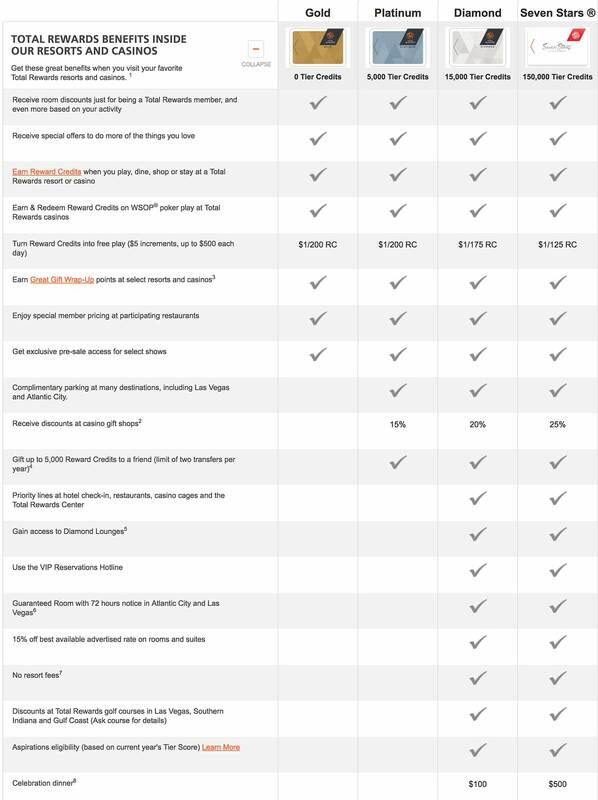 A lot of the digital business redemption costs can also be used internationally, but I’m not sure in terms of retail benefits as I think most of those are restricted to the U.S.
Let me know what perks interest you most and I’ll see if I can figure out if they work abroad in addition to the United States. Thanks, Colt. You are confirming my thoughts regarding the shopping aspects. As for flying and lodging, it might appeal occasional travellers. But frequent ones usually already have premium status with several hotel chains and airlines. Again, it depends on the retailer and there are some international options that still work. As for travel, most of the airline perks actually cater to international travel (instant discounts on airfare or automatic upgrades to loyalty tiers without needing to earn them) and there a decent selection of deals on non-chain hotels in other countries. It all really depends on a case-by-case basis, but overall might not be the right fit if retail benefits are your primary motive! Hope it helps, let me know if you have any further questions about specific perks and whether they work in your country. it is definitely worth the cost. The benefits far outweigh it. I love my membership. Caesars gives you a $100 dinner voucher every year too! I appreciate your comment and have to agree. The $100 dinner voucher has been an awesome perk and the Bacchanal Buffet is simply amazing, it is my go-to place for redeeming the $100 credit. What a great review for this card. I hadn’t really thought about this card until I heard about the Total Rewards Diamond status upgrade and the $20,000 fee-free payments through Stripe. From what you wrote, it seems that the Diamond upgrade occurs every year, but do you know if it’s the same for the $20,000 fee-free payments through Stripe? If they’re both available each and every year you’re a FoundersCard member, I may just be swayed! Appreciate the praise, we worked hard on providing as much honest information on our FoundersCard experience as possible. You are correct about the Diamond upgrade yearly so far as I’ve been upgraded for the last 3 years without issue. However, the FoundersCard Stripe benefit is new and I don’t think you’ll get it yearly, it appears to be just for the first 12 months. “Benefit applies to Members in the US, UK, Canada or any Eurozone country supported by Stripe. Offer cannot be used on Shopify Payments accounts. Discount will be applied within 7 days. You will see a confirmation in your Stripe dashboard the next time you log in after the discount is applied. Please note that you will still see a fee listed on each charge, but they will be combined and credited back to you as an adjustment when Stripe calculates the total for each payout. You will be able to see the adjustments and final payout amount on your dashboard  once each payout is scheduled.